My Farms is located in Dittmer, Missouri, 30 miles south of St. Louis, MO on ~ 8 acres with full rights of a 3-acre private lake. The Farm is unique being the first commercial Fig Farm in Missouri, which was started in 1996. Although Figs are the primary and most profitable crop, with 16 varieties of Figs currently grown, a wide variety of vegetables, heirloom tomatoes and peppers, lettuce, greens, strawberries, and herbs are grown organically on the farm and sold at local farmers’ markets four days a week. I participate as a local grower for the “Fair Shares” CSA, which is a group of 300 members, on a weekly basis as well as a supplier of restaurants and grocery stores in the St Louis area. ground during the day and then at night the stored heat is used to heat the tunnels. During the coldest time of the winter the system taps into the constant source of 55 degree F of geothermal energy. When the temperatures drops to -15 degree F outside, it is blowing 55 degree F from the ground into all 3 of the high tunnels. As a backup for extremely cold winters, the tunnels are equipped with two CleanBurn oil furnaces, burning used oil. Three of the tunnels are entirely dedicated to growing fig trees, planted straight into the ground. The other two high tunnel are used for growing early heirloom tomatoes, eggplant, peppers and greens. How bad can it get? Cold spot Infestation of Mealy bugs on fig leaves. 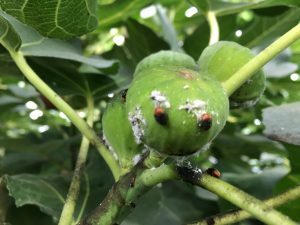 Mealy bug infestation has become a serious problem when growing figs commercially in greenhouses. To combat the persistent annually recurring infestation of Mealy bugs we have attempted to apply an integrated pest management control, with a focus on biological control, supported by the 2016 SARE Farmer and Rancher grant. For that purpose we used the Mealy bug Destroyers, Cryptolaemus montrouzieri, a predatory beetle introduced in the US in the late 1980’s from Australia. It is an effective predator of Mealy bugs and it has been successfully applied for pest control treatment of Mealy bug infestations of citrus crops. 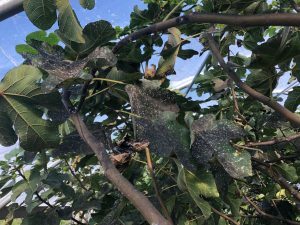 Since there is no Mealy bug infestation on our control fig trees grown outside the greenhouses, we attribute the problem to the specific conditions created inside the greenhouse, which seem to be perfect for the now recurring mealy bug infestation. Therefore, for this project we have also attempted to manage temperature and humidity in the greenhouses by installing ridge vents on the top of the hoop houses to make those conditions less favorable for Mealy bugs. RESULTS – Managing environmental conditions: Comparison of the results from figs grown in a regular hoop house, with only side curtains for venting and a hoop house equipped with ridge vent showed a considerable improvement by delaying the mealy bug infestation from May to August, 2016. This we attribute to the better ventilation of the upper dome of the hoop house. The upper dome in the current hoop houses retain a lot of moisture, which condenses and drops on the figs and leaf canopy. This creates the perfect conditions for the mealy bugs. They do not have a chitin exoskeleton and depend on the moisture. To adapt and survive they excrete cotton like cellulose fibers that retain water and maintain the necessary moisture. 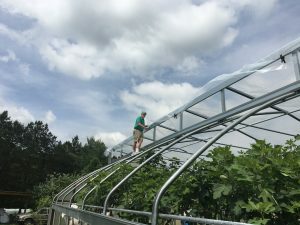 The 2’ ridge vent, which runs along the whole 96’ of the high tunnel, opens automatically and simultaneously with the 4’ side curtains and creates a “chimney effect” that draws fresh air from outside and exhausts the hot air through the vent. RESULTS – releasing predatory beetles: Although the ridge vent system had such a significant effect in delaying the Mealy bug infestation from May to August, it could not prevent it further through the later part of the fig growing season after August, when the night temperatures start to drop and the curtains close more often and for longer periods at night. On August 25 we introduced the Mealy bug destroyers to combat the exponential Mealy bug infestation. We released a total of 5,000 Mealy bug destroyer beetles, purchased from Arbico Organics. They arrived in perfect condition without any dead insects and were immediately released before dusk among the hoop houses. The Mealy bug destroyer beetles were soon getting on the mealy bugs as seen from the pictures and video clips. And we hoped we were on the right track. However within the next few days, it was getting more and more difficult to find the beetles among the leaves of the enormous leaf mass of the fig trees, and soon we realized that they had almost all escaped from the greenhouses. There weren’t any dead ones found either. We contacted Arbico Organics to ask for an explanation. They told us that the optimum temperatures for the beetles are between 65 and 85 F. and that they can make it to 95 F and higher, saying that they have them in Arizona. During that time we had a heat wave of 96 F outside, and the curtains and the ridge vent were completely opened under these conditions. We still don’t know if this caused the escape of the bugs outside the greenhouses and are working with Arbico’s specialists to figure out why. They recommended that next year we should try to introduce the beetles much earlier in the season, when the temperatures are not as high and they have more time to adjust to the conditions. We continued to monitor the very few beetles left and later on we found some larvae of the beetles, (see picture). Late in the season we found some beetle larvae that later hatched into beetles again. This is exciting news because it shows that those predatory beetles that stayed were reproducing under the greenhouse conditions. OVERVIEW – 2017 season: In 2017 we plan to purchase and release step wise smaller numbers of the Mealy bug destroyers as early as May. We will monitor closely their adaptation to the greenhouse conditions. We will also start our own production of the Mealy bug destroyer in enclosed structures, to adapt them better to the greenhouse conditions. Lincoln University researchers will kindly donate insect cages so that we can keep small numbers of predatory beetles inside along with mealybugs, as a food source. We will record if they survive and reproduce inside the cages. In terms of managing the environment, the installed ridge vent system will help to control better the temperatures and the humidity and maintain optimal temperatures for the beneficial insects inside the greenhouse. In 2017 we closely monitored the greenhouses for the first signs of the appearance of any Mealy bugs. All greenhouses were now equipped with the ridge vents. The figs were ripening and picked daily through the month of July. We could not see any detectable Mealy bugs until the end of July when some of the first Mealy bugs started to appear. We immediately ordered the first batch of 500 Mealy bug destroyers from Arbico Organics. They arrived in very good condition and were immediately released in the greenhouses at the points of the first detected Mealy bugs. The temperature conditions were 80 degrees F, within the optimal specified range. The release was done in small portions and their behavior in each release was documented by multiple pictures and videos. Most of the Mealy bugs destroyers were transferred on the Fig leaves and they had the opportunity to move around on the surface of the leaves and some crawled over the back side of the leaves or along the stems and the branches. When they encountered a Mealy bug they tried to attack them. An interesting observation was made that after the initial attack they would stumble and step back, then stay as if they were sprayed with a paralyzing spray and as soon as they recovered they moved away from the Mealy bugs. However it was not long before they started to fly away up towards the plastic ceiling of the greenhouse, probably attracted by the light coming through. Pretty soon most of them ended up on the plastic ceiling, being unable to fly outside and away from the greenhouse. They kept trying to escape and did not return back to the canopy of the figs. By the next day there were hardly any detectable left on the figs, except the few dead on arrival. By the next few days all of them had found their way out through the ridge vent or the open side curtain. Only after over a month we found a few larvae probably from eggs laid by the Mealy bugs destroyers before they escaped or from just a very few that probably stayed and laid their eggs. This observation was very disappointing and we decided not to continue with purchasing and releasing any further batches of the Mealy bug destroyers. We did not want to see these very expensive bugs vanish and not perform as expected. Instead we decided to experiment with them in a closed system, to study and understand better their behavior. We used plastic cages, generously provided by Dr Pinero. We supplied the cages with freshly picked Fig leaves that were infested with Mealy bugs as a food source as well as cotton swabs soaked with water and grape raisins, pre-soaked in water to become tender. This setting provided ideal conditions for observing and documenting with pictures and videos the prey and predator behavior in the closed system. The beetles demonstrated their predator behavior attacking the prey and if necessary fighting with other intruders. Again we could observe very clearly the defensive behavior of the large Mealy bugs, which will point their rear tentacles up in the air, as if they were spraying a paralyzing repellent spray. The beetles although very capable, seemed to avoid the large adult Mealy bugs but very ferociously ate the smaller ones and their eggs. We could document in a video how once a Mealy bug gets defeated by a destroyer it gets chewed and eaten up. However this did not happen on a larger scale within the greenhouses, where the beetles flew away. We continued the experiments in the closed cages for over a month, trying to produce more beetles. They were very actively copulating as documented with videos. Despite all the food of Mealy bugs on fig leaves provided, the beetles were gradually dying until they were all gone. However we were able to observe some newly hatched larvae, indicating that they did lay eggs and hatched under these conditions. Their numbers were too low to be sufficient to provide significant quantities to introduce back into the greenhouses. 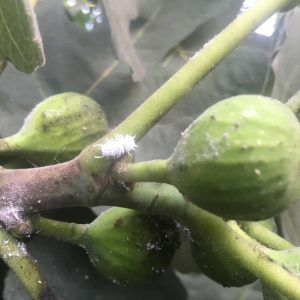 As a conclusion we think that the Mealy bug destroyer is not an applicable approach at this point to be used for pest control management of Mealy bugs infestation of figs. This is because of their greenhouse inhabiting behavior, and their high cost and difficulties for inexpensive, large scale production. Using their larvae might overcome the fly away issue, but the cost might be still prohibitive. Our results with the ridge vent ventilation of the greenhouses turned out to produce a much more efficient way of resolving the problem. The areas of the greenhouses which were well vented showed very good results ~ 75% from the whole greenhouse had no Mealy bugs. The Mealy bugs infestations were primarily in localized spots which were the “cold spots “ of the greenhouses, where moisture condensation and mold formation were more obvious. This was more pronounced in the case of 3 greenhouses joined as one along their side walls compared to a single one with both sidewalls opened. Although the ridge vent system helped tremendously for extended control of the Mealy bugs infestation during the harvest season from June through September, it was no longer effective after that, when it got cold in the season and the greenhouses stayed closed most of the time. The humidity started to build up again with the rain forest effect in the morning when the sun heated up the greenhouses.This created again perfect conditions for the extension of the Mealy bugs infestation. It was a pleasantly amazing observation that the single High Tunnel with a ridge vent did not have any Mealy bugs at all during the entire year! We had a year round excellent crop of figs without any Mealy bugs, from this tunnel. However the greenhouse consisting of three High tunnels, joined as one along the side walls of the one in the middle, had some areas of very serious and persistent infestations, located in those “cold spots” towards the middle and the North sides in the greenhouses, with signs of more noticeable water condensation. It was also occurring close to the outlet areas of the geothermal system, which is blowing either colder air during the day in the summer or warmer and more humid air at night in the colder seasons, creating favorable conditions for the Mealy bugs. Further research would be necessary to understand better the reasons and find ways to resolve these problems. We will also try to experiment with an alternative Bio protection with a Micofungicide, like Bioceres WP, to treat the Mealy bug infestation in these “cold spot” areas as soon as they appear, to prevent in a timely manner the explosion and spread of the infestation. 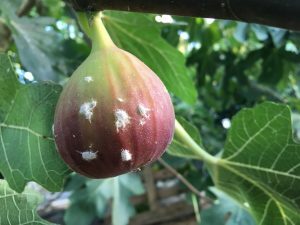 Eliminate or substantially control the mealy bug population density in figs grown in high tunnels using beneficial insects: mealy bug destroyers. Research the possibility of creating conditions favorable for the beneficial insects to reproduce and multiply inside the high tunnels. Control temperature and humidity in the high tunnels using fans and ridge vents with thermostats. The project was documented with numerous pictures and videos demonstrating the experiments with the Mealy bug Destroyers, their predator behavior in open and closed systems. 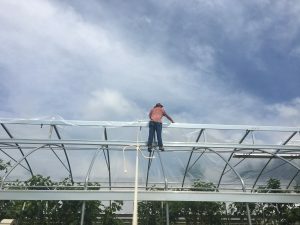 We have build a unique and efficient ridge venting system for the High Tunnels to control the growing conditions in the High Tunnels that creates a better growing environment not only for figs but for many other High tunnel crops. In this system the ridge vent and side curtains open or close simultaneously in a 1:2 ratio automatically, controlled automatically by thermostats, powered by solar energy. The documented knowledge and experimental procedures in this project report will be a useful educational resource for the farmers that grow or will be growing figs or other crops, which will save time and efforts in their struggle with Mealy bug infestation problems. The results from the experiments with the biological pest control demonstrated the difficulties with solving the problem associated with the specific greenhouse application. The successful application in treatment in the open citrus orchards was not reproducible under the greenhouse conditions and instead an unexpected behavior of the Mealy bug destroyers did not allow the application of this approach under these conditions. 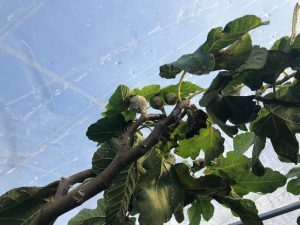 The more effective way turned out to be the control of the High Tunnel parameters of humidity and ventilation which resembled more the open outside conditions of growing the figs, where no Mealy bugs appear throughout the entire growing season. Based on this results at this stage I do not recommend the use of Mealy bug Destroyers as pest control in High Tunnels. The use of their larvae might work better but they are not commercially available and if they were, that would be cost prohibited. The alternative ridge system is a better solution of the problem. Despite it’s cost as a draw back, the ridge vent system has many other benefits for creating a better controlled environment not only for growing figs but also for other High Tunnel crops. As a result now we have a higher yield of high quality figs without mealy bugs.